The ALD Innovator award “For Original Work and Leadership in ALD” will be presented on Monday prior to the Plenary Lectures. 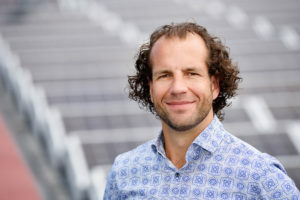 Biography: Erwin Kessels is a full professor at the Eindhoven University of Technology TU/e where he is also the scientific director of the NanoLab@TU/e clean room facilities. Erwin received his MSc and PhD degree (with highest honors) in Applied Physics from the TU/e in 1996 and 2000, respectively. His research interests cover the field of synthesis of ultrathin films and nanostructures using methods such as (plasma-enhanced) atomic layer deposition (ALD) and atomic layer etching (ALE). Within the field of ALD, he has contributed most prominently by his work on plasma-assisted ALD, his research related to ALD for photovoltaics, and ALD for nanopatterning (including area-selective ALD). Currently Erwin is focusing his research on atomic scale processing, a field which is believed to grow in importance quickly in the next decade for a wide variety of application domains. He was chair of the International Conference on Atomic Layer Deposition in 2008 (Bruges, Belgium) and he frequently (co-)organizes ALD-related workshops. He will serve as chair ALE workshop in 2020. Erwin is active within the American Vacuum Society and has been President of the Netherlands Vacuum Society. He is an associate editor of the Journal of Vacuum Science and Technology. He is also the founder of the blog AtomicLimits.com and of the ALD Academy. Atomic scale processing is the collective term for processing methods that are currently more and more being explored – and industrially employed – to prepare thin films and nanostructures in a highly controllable way with atomic scale precision. Atomic layer deposition (ALD) and atomic layer etching (ALE) are two prominent examples but also state-of-the-art nanopatterning and area-selective deposition (ASD) approaches can in many cases be regarded as examples of atomic scale processing. In this presentation, I will address several recent and emerging trends in atomic scale processing and discuss how understanding of the underlying mechanisms has contributed to important innovations in the field, either in research or in industry. Application areas to be addressed are especially nanoelectronics and photovoltaics which I will discuss from my own experience and perspective. Topics to be discussed are: (i) the growing importance of plasma ALD, aspects such as conformality and the role (and control) of ions; (ii) the necessity of in situ metrology methods (e.g. in situ spectroscopic ellipsometry) for process monitoring and advanced surface spectroscopy for obtaining more quantitative insight into fundamental parameters; (iii) the use of ALD in nanopatterning and the interest in area-selective ALD including those combinations with intermediate etch steps; and (iv) the need for isotropic and anisotropic ALE, either thermal or plasma-based. ALD student awards have been established to recognize outstanding research performed by a graduate student in areas of interest to Atomic Layer Deposition. All Student Awards will be presented on Wednesday during the closing remarks. Five ALD Student Finalists have been chosen from the submitted student abstracts and are listed below. ALD Student Finalists will receive a $500 award upon completing the competition. Competition for the award requires attendance at ALD 2019 and a student presentation of the work in an oral session. The ALD Best Student Paper Award winner will be selected on the basis of the oral presentation, considering quality of research and clarity of presentation. The award is sponsored by Lam Research and consists of a $1,000 cash prize and a certificate. Best Student Paper Award for Research Related to Semiconductor Applications of ALD: Up to three finalists will be selected for this award based on the quality of their abstract, novelty of the research, and its relevance to the semiconductor industry. The winner will be judged based on the oral presentation at the conference by members of the ALD Program Committee. This award is sponsored by Eugenus. Each finalist will receive a cash prize of $250 and a certificate, and the award winner will receive an additional cash prize of $250. In addition, several ALD Student Poster Awards will be presented on Wednesday during the closing remarks. All accepted student poster abstracts are eligible. ALE student awards have been established to recognize outstanding research performed by a graduate student in areas of interest to Atomic Layer Etching. Six ALE Student Finalists have been chosen from the submitted student abstracts and are listed below. The first place ALE 2019 Best Student Paper Award consists of $1,000.00 USD sponsored by Lam Research and a certificate. The second place ALE 2019 Best Student Paper Award consists of $500.00 USD and a certificate. The awards will be presented to the winners on the last day of the conference during the closing remarks. ALE2-MoA15: ALE of GaN (0001) by Sequential Oxidation and H2/N2 Plasma, Kevin Hatch, D. Messina, Fu, K. Fu, X. Wang, M. Hao, Y. Zhao, R. Nemanich, Arizona State Univ. In addition, several ALE Student Poster Awards will be presented on Wednesday during the closing remarks. All accepted student poster abstracts are eligible. Tuomo Suntola, Jorma Antson, Arto Pakkala, Sven Lindfors, Outstanding Paper Award for Atomic Layer Epitaxy for Producing EL Thin Films, The Society for Information Displays (SID), USA, 1980. Tuomo Suntola, Award for Electroluminescent Display Technology, The Association of Finnish Electric and Electronics Industries, SETELI, 1980.